Everyone is concerned about privacy these days. With the Snowden revelations coming out that the NSA had been spying on Americans’ digital behavior and activity, and were allegedly partnering with such internet companies as Google, people have been concerned about privacy solutions to keep themselves protected from prying eyes. Disconnect, a San Francisco-based startup, specializes in building software that can cut off intrusive advertisers from grabbing user’s data, and protect web activity with encryption. However, the average Android user won’t have heard much about it, not through Google anyway. 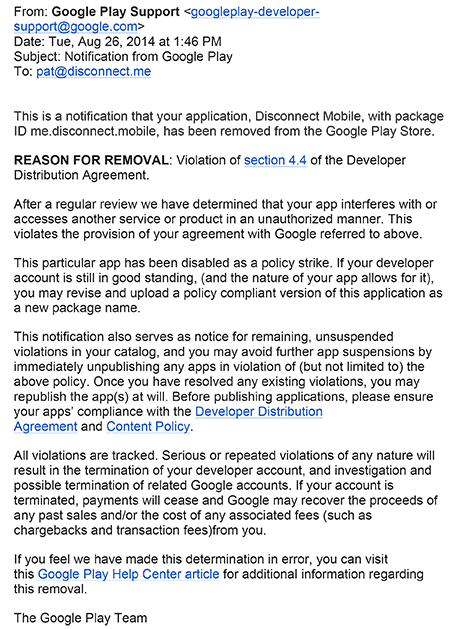 Google has removed the tool from it’s Google Play application marketplace. The startup isn’t backing down in it’s fight for protecting people’s privacy, though. The young firm, who’s CTO is ex-NSA engineer Patrick Jackson, has been wrestling with Google over the past year to get it’s app back on the Google Play marketplace, in an effort to get more Android users the ability to protect themselves from government snoops and digital criminals. While it’s pretty much a losing fight, Disconnect won’t let Google slow it down. Yesterday, Disconnect launched a completely refreshed application that does a lot to protect data by encrypting communications, routing traffic through different servers across the globe, filtering out more than 5,000 “invasive” services, and much more. All things considered, at the end of the day it’s a VPN software – though it has plenty of bells and whistles. It isn’t particularly pricey in the grand scheme of downloadable software prices: the full desktop and phone application that covers up to three devices comes at $5/month, or $50/year. Some pieces will continue to be free of charge, such as the tracking visualization browser add-on. Disconnect has some significant voices in the security industry on its side. Blackphone – a privacy-specific smartphone based on a forked version of Andriod – has made it a standard install on each of it’s units. And the “next generation” version will come pre-installed on future Blackphones. Disconnect isn’t the only company with this kind of product and service, it’s just the first major one to have an established partnership with a secure phone maker. Disconnect has also announced another significant partnership with German ISP giant Deutsche Telekom, who is offering a special promotion to their customers, allowing them to try Disconnect Premium features free for a year. The company itself isn’t only in the business of pushing products on the privacy-concerned consumers, as it explains. CEO Casey Oppenheim is of the belief that Google doesn’t want Disconnect in its Google Play store because the app educates consumers about how advertisers collect people’s digital data and that the software allows users to block them. Basically, it’s shining a light on the existence of the option to not be tracked digitally. In September, things came to a crescendo when Google sent a letter directly to Disconnect informing it the app would no longer be available for purchase or download on it’s marketplace. It apparently broke one of Google’s cardinal rules: you cannot interfere with other apps “in an unauthorized manner.” However, Disconnect is in perfectly good standing on other platforms, including Apple’s iOS marketplace. You could look at this more cynically and make the conclusion that Google’s pulling of Disconnect from it’s marketplace is an effort in self-preservation, in that Google relies on advertisers to make revenue, no matter how intrusive they are. Essentially, in a scenario where privacy and security conflicts with Google’s business model, Google will choose the business model. This isn’t a revelation really; any company would behave exactly the same way. People don’t want to believe that Google is like every other corporation, but in reality it is. Disconnect is aggressively pursuing being welcomed back into the Google Play store again at some point, though it’s possible to tinker with Android settings to allow downloads from unauthorized developers (warning: do not do this, it could badly harm your device as well as open you up to malicious developers as well as helpful ones). Though, it’s re-introduction to Google’s application marketplace is predicated mainly on Google updating it’s outdated user agreement before that happens. The only question remaining is why Apple and not Google? It’s hard to say. Maybe Apple considers privacy to be more valuable to it’s success than Google. But, given that the public has ben increasingly upset with Google for it’s alleged collusion with the NSA, it’s probably in the tech giant’s best interest to lift it’s ban and give its users the option of flying under the radar if they choose too.